Like every architect who visits Architecture Island, Daren Srange’s first question was ‘is there a way to import existing 3D models? 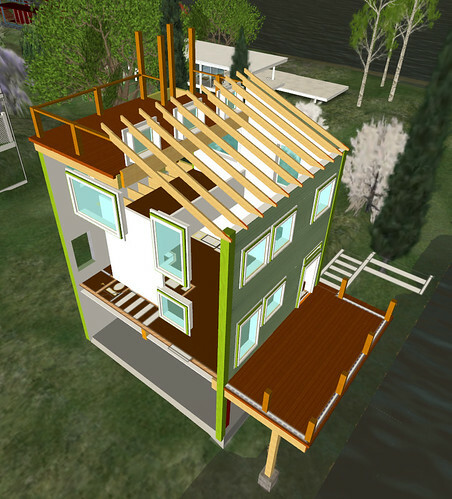 Instead of dwelling on the setbacks of learning the in-world building tools, Daren immediately ‘got it’ and embraced the tools, making the best of what Second Life currently offers. While we all await a day when we can seamlessly integrate our 3D models into Second Life, I think designers like Daren deserve to be rewarded as early adopters and innovators in this field. Daren has a Bachelor of Architecture degree from the University of Texas at Austin, and has worked professionally as an architectural intern. More of his work can be seen at East Tower Design. I tried my best to ‘help’ Daren in the earliest manifestions of his project, but he was so quick to learn that he always seemed to be two steps ahead of where I was directing him. With skills like his, it won’t be long before Second Life developers start approaching him with employment opportunities. He has already admitted a temptation (read desire) to leave the real world behind and become a virtual architect. Given the growing (increasingly fierce) competition for in-world design/build talent, coupled with the explosion of virtual world content demand in general, I think Daren is wise to consider a virtual transition.